Does your office need Regular cleaning? Can you remember the last time you looked around your place of business and thought that it was spotless? If it’s been awhile, it might be time for a thorough cleaning. immaculate each time you walk through the doors"
Flexible - You can schedule your one-off clean for a time and day that suits you, we will work around you because we know you have specific requests (classed as level 3 in our system) as oppose to the residential clients. Trustworthy cleaners - All Life Maid Easy cleaners undergo thorough reference checking, starting with a police background check, employment reference check, credit check and drug testing in addition to the Life Maid Easy training to ensure that your home and your belongings are safe and secure. 97 Point Deep Cleaning System to clear away dirt, grime and build up in 'hard to get to' areas. You receive a completed checklist of all the areas cleaned and notes for any areas that require special attention. Our HEPA Filtration Vacuum System that extracts 99% of all dust bacteria, allergens, fur and pollen and makes it easier to professionally shampoo your carpets after your one-off clean. Wide Service Area - We can travel to you free of charge within the Auckland Isthmus, North Shore, East, West & South Auckland areas (view map). We can also travel to outer areas at an additional travel charge, so please ask us if you are unsure. No surprises - You can rest assured that your home will be left sparkling clean, with no hassles, no missed areas or extra charges for cleaning work that you didn't agree to. You're in control - You can specify certain areas you want us to pay special attention to. We send you a cleaning specification sheet before your clean, which we check off and provide a copy of to you after the clean is completed. Quality Control - Brenda Griffith with her decades of experience in domestic cleaning conducts quality checks during and after cleans. She also trains our cleaning teams on a regular basis to they are up to date with the latest cleaning techniques. You can be assured that we are 100% behind our promise of a 5-star clean that you deserve. Rental properties that need a thorough clean so you can get your bond back or to make presentable to new tenants. Designed for homes that need to look absolutely immaculate for an important gathering or upcoming open home. When preparing a house to be put on the market, nothing is more important than cleanliness. Let us help your Seller by quickly and completely cleaning their home to give the best first impression that means attention to detail, final touches and polishing up surfaces. Become a LIfe Maid Easy Partner today! Homes that are regularly cleaned and need a once over to get your bond back, or be ready for a new tenant. Ideal if you want a 'Spring Clean' to freshen up an already tidy home prior to having the family round for a special occasion. If the dirtiness of your home is less than a five on a scale of one to ten, with one being crystal clean and ten being a pigsty, then the Move out/in one-off clean is right for you. For homes that are being prepared for an open home we highly recommend the Top to Bottom "Deluxe" one-off clean. Everything is hand-wiped. No dusters. The map below indicates our service area that we travel within. If your home is outside this area we can still help you. You can pay for travel time at $40+GST/hour. For example, an extra 15 minutes of travel time each way (30 minutes total) will cost and extra $40+GST on top of your clean. We clean areas from Orewa to Pokeno and Piha to Maraetai. We will call you to learn about your requirements and give you a no obligation estimate for your clean. The day before your scheduled one off clean we ask that payment be made bu credit card. Your home will be left clean and looking immaculate. A checklist will be left detailing all areas cleaned and any notes that we want you to be aware of. How soon can you schedule a move-in/move-out clean? Can I schedule a move-in/move-out clean for the weekend? It depends on the size of your home and how thorough you want the clean to be. 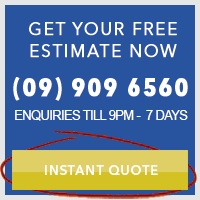 Please enquire online or call us on 09 909 6560 for a no obligation estimate that is specific for your home. I’m interested in ongoing cleaning of my home. Do I need a one-off clean? If your home is already quite clean (gotta love those hours spent cleaning on a Sunday!) then you can go straight to regular, ongoing cleaning. If your home is quite dirty or hasn’t been cleaned regularly then we recommend you invest in a one-off clean to get your home looking tidy again. If we take less time than anticipated (admittedly this is rare) then we will only bill you for the time taken to clean your home and then refund the balance to your nominated bank account. What if you need more time to clean my home than you estimated? Because we quote your one-off clean sight unseen over the phone we cannot always accurately estimate the time it will take to clean your home. If we need more time then we will call you beforehand to ask your permission and give you a fixed price for the additional time required. Each week we complete 730 ongoing and one-off cleans for Aucklanders just like you. Choose the cleaning company that is highly experienced in one-off spring cleaning to ensure you are left with the clean home you deserve. "It’s freed up about 6 hours for us in the weekend and it’s made it a bit more pleasant when you come home. It’s quite invigorating when you come home and you’ve got a nice clean house, and you didn’t have to do anything to it.